GalWGA7-2-18-6a. Overview of Galago epithelium at the fulcrum near the equatorial plane. Vibratome section (120 µm thick) stained with Wheat Germ Agglutinin (WGA) for cell surface (red, 488 nm laser), Phallodin-F-Actin-Alxexa 561 (green, 567 nm laser), DAPI for nuclei (blue, 405 nm laser). Portions of four Radial Cell Columns (RCC1-4) are visible. Nuclei from the epithelium, early fiber cells and a portion of the bow zone are visible. Conclusion: All key features of the outer lens surface at the transition from epithelium to fiber cells is very well preserved and delineated. 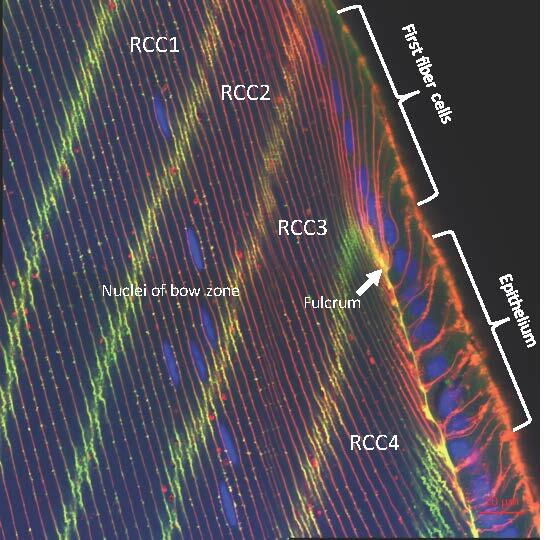 Filamentous actin is concentrated at the Epithelium- Fiber Cell Interface and along the irregular interfaces between adjacent RCCs. Zeiss 880 with Airyscan has been upgraded with Fast Airyscan for high-speed confocal with increased resolution. Airyscan gives a 1.7x improved resolution in x, y and z and improves the signal to noise ratio 4-8x. Fast Airyscan is 4x faster than Airyscan or confocal with some loss in resolution but higher than confocal. The HIC uses iLab for making equipment reservations and billing. If you have already created an iLab account for another core on campus you do not need to create another one. Follow the link below to create a new account or make a reservation. PRICING by instrument is on the iLab site. For quick reference our prices for unassisted use are as follows. Tier 1 confocal microscopes (there are 3) are $31.36 per hour. Tier 2 confocal microscopes (there is 1) are $16.80 per hour. Tier 3 widefield microscopes (there are 7) are $14.52 per hour. VivaView is $10 per hour. Transmission electron microscope is $35.00 per hour. The Tier 1 Zeiss 880 confocal laser scanning microscope offers high sensitivity, (enhanced resolution in x, y and z,) and high image-acquisition speed. The Tier 1 Olympus FluoView FV1000 is designed for high-resolution, confocal observation of both fixed and living cells. In addition, the FV1000 offers a revolutionary synchronized laser scanning system called the SIM Scanner. While one laser stimulates, the second laser simultaneously provides high-resolution imaging. This coordination of laser stimulation and imaging makes the FV1000 an ideal choice for FRAP, FLIP and photoactivation with simultaneous observation. Our newest confocal microscope. This Tier 1 upright scope will be useful for cleared tissue, zebrafish, any wet preps with dipping lenses, and general fixed specimens. * 3 GaAsP confocal detectors. The emission path uses variable dichroic mirrors to achieve flexibility of bandpass adjustment similar to spectral detectors that use a prism or a diffraction grating. * Tiling is easy to set up, very user friendly. The VivaView Incubator Fluorescence Microscope provides a fully integrated and motorized inverted microscope to allow high quality, long-term time-lapse imaging in a constant and optimized environment. Multiple locations in each of up to eight 35 mm dishes can be imaged for each time point with fluorescence and/or DIC. VivaView is $10 per hour. * Liquid handling assist Motorized open/close control of designated dish. Manual pipetting through the small opening on the internal door of the incubator. The Tier 3 Nikon 2000E inverted widefield micorscope is a high performance system that can perform complex and rapid acquisition tasks. It is one of several widefield systems in the HIC. The system is equipped with a Hamamatsu Flash 4 CMOS camera for rapid and sensitive detection of fluorescent and transmitted light signals. It is also equipped with an encoded stage and filter wheels for time lapse imaging, tiling/stitching and multi-point acquisition among others. Image acquisition and microscope devices are controlled through MetaMorph. The Leica MZ16FA is a fully automated planapochromatic fluorescence stereo microscope. The filter changer, zoom, focus, UV shutter and double iris aperture are computer controlled which allows multifluorescence experiments to be repeated quickly and accurately. Modern electron optics produce high resolution images of a variety of sample types including thin sections, negative stain on grids and freeze-fracture replicas. * Accelerating voltages from 40kV to 120kV using a tungsten filament; a highly stable goniometer controls x, y, z and tilt positions. * Equipped with a Gatan 1k x 1k digital CCD camera (Model 794) and Digital Montage software for creating montages with up to 7 x 5 frames. -A new Gatan Rio16 fast CMOS 4k x 4k camera has been ordered for installation in early 2019. * Accessories include a Gatan 626 cryostage, pumping station and temperature control unit for examining thin samples embedded in amorphous ice using low-dose conditions. * Sample preparation equipment available for cutting thin sections, freezing thin samples on grids and freezing larger samples with a high pressure freezer. * Assistance and training available for sample preparation and examination of specimens.